We have been interviewed many many times for print, radio and television; been quoted in probably hundreds of newspaper and magazine articles, and written for both lay publications and professional journals, and presented to pet professionals and pet parents on 4 continents, but until now have not been good at keeping track of our interviews, or keeping an up-to-date media page. One of our resolutions is to keep this page current, by posting our media activities in chronological order. – We haven’t been perfect in our resolution, but are getting back to it in 2011. Check back frequently to see what we’ve been up to! We fell down on the job for a few months, but still tring to be more consistent! Suzanne was interviewed for Cat Fancy’s Kitten Issue. The article, by Helen Jablonski "Mind Your Manners" discussed techniques to teach kittens good behaviors such as how to play with people without biting or scratching, and helping kittens use the litterbox and scratching posts reliably. Publication: We wrote an article for the CVMA Voice Newsletter (2010), Issue #4, pp. 20-21) on "The Effect of Different Dog Training Methods on Fear and Aggression". In it, we discussed several studies that addressed the question of whether some training methods caused more fear and distress than others. The short answer is that techniques and/or equipment that causes pain or are physically confrontational are more likely to result in fear and aggressive behavior in return from dogs. A study discussed in Time magazine, interestingly, reported that children spanked as 3 year olds, were more likely to behaivor aggressively as 5 years old. Publication: Suzanne and Dan penned an article for the CVMA Voice Newsletter (2010, Issue #1) entitled " Four Keys to a Happy and Harmonious Multi Cat Household. The four keys are: 1. understand the natural history of the housecat; 2. recognize that most cats are socially awkward; 3. micro-manage introductions, and 4. arrange your home to minimize conflicts. You can find links to the Voice online at www.ColoVMA.com. Interview: Dr. Hetts was interviwed for an article in the April issue of Cat Fancy magazine on training kittens. She spoke to the author, Helen Jablonski, about how to safely play with kittens whils also meeting their behavioral needs. Suzanne also talked about factors to consider in providing litterboxes and scratching posts kittens are most likely to use, and at the same time tips for preventing damage to household items. Presentation: On March 25th, Suzanne gave a noon lecture to 1st and 2nd year veterinary students at the University of Tennessee on "Keeping Cats in Their Boxes and on Their Posts". That evening she presented to an audience of 95, a public lecture on "Keeping Cats Happy". The program was webcasted live and a link will be available later here for the replay. Interview: Suzanne was interviewed February 24th via Skype by Mega TV, a Spanish language station in Los Angeles about the tragic attack on a trainer by a whale at Sea World. Listen to the interview HERE. Interview: Suzanne was interviewed on January 18th by a reporter from the Chicago Tribune regarding a fatal dog attack. Click Here to read the story and what Dr. Hetts had to say. "A scientifically trained animal behaviorist would consider all possible alternatives, and would not suggest a ‘why’ for the behavior without more infomration and observations". Grab a copy of the magazine at your local bookstore to read the entire article. Interview: Suzanne and Dan were interviewed for an upcoming article about hypnosis for dogs. Can dogs be hypnotized? We discussed the misconceptions about this idea that can be seen on websites on this issue, and talked about the disconnect between the scientific literature and popular media claims. We discussed classical conditioning, conditioned emotional responses, counter conditioning, desensitization, tonic immobility, terrifying /intimidating a dog such that he freezes is NOT hypnosis, etc. etc. This is an article that will appear in Animal Wellness magazine – we’ll let you know when, but it will likely be several months. "By six weeks of age, the nervous, sensory, and motor capabilities of puppies and kittens, while not fully mature, are sufficiently developed to allow them to explore thier world and show a variety of behavior patterns. As this stage, your young animal is willing to try almost anything, as few behaviors have yet been rewarded or punished. These youngsters are learning which behaviors "work" for them and which do not. They are forming behaivoral ‘habits’, or their characteristic way of coping with the world." Publication: Drs. Hetts and Estep penned an article for Mile High Dog Magazine, titled "Learn to See What Your Dog Is Telling You" that discusses canine body language and communication between dogs and between dogs and people. Did you know for example that tail wags do not always indicate friendliness, and that there are BIG discrepancies between what’s in the popular dog training literature as compared to the science-based literature about "calming signals"? Find out MORE in this article. Publication: Drs. Hetts and Estep wrote an article for the CMVA Voice (Issue 4, 2009) on "Dispelling Myths about Social Dominance and Dog Behavior". We certainly didn’t lack for material, as the popular and dog training media are fraught with myths and misconceptions when it comes to social hierarchies, "dominance" and how these ideas affect relationships between dogs and people. If you think you need to be your dog’s "pack leader", you’ll find out differently in this article. Interview: Suzanne was interviewed by author Eve Adamson for an article in "Training Secrets for Rescued Dogs", published by Dog Fancy Magazine for its "Popular Dogs" Series. This was the lead off article for the issue. Suzanne addressed issues such as the common but usually erroneous conclusion that many adopters of shelter dogs come to when their dogs are afraid of everything things – that the dog has been abused, rather than just poorly socialized. Learn more about Suzanne’s take on shelter dogs and separation anxiety and dealing with a dog’s past traumatic experiences. The magazine can be found at most pet supply stores. What is the best thing to do if a pit bull — or several pit bulls — comes charging at you? "Look at it as a dynamic event," advises Daniel Estep of the National Animal Control Association’s training academy. "If the dog is 50 yards away and starts after you, if you can escape somewhere — inside a building, or on top of your car, or jump a fence — then that’s probably the best thing to do. If the dog is closer than that, then that’s not a good idea. In a footrace, you’re going to lose. "If the attack is imminent, try to shove something in his mouth, hopefully a non-body part. If you’ve got a briefcase or a clipboard or even a coat, shove that at the dog. Most of the time, dogs are going to bite the first thing they get their teeth around. And then you can try to walk your way out of the situation. "If that’s not possible, feed him your nondominant arm. Arm, not hand. And let him grab onto that and try to get yourself out of the situation. The last thing you want to have happen is to be taken off your feet, because then it’s much more difficult to protect yourself from serious injuries. "If you get brought down, the best advice is to curl up into a ball and try to protect your belly and chest area. Cover your neck with your hands and loop your arm around so that it covers your face. When people roll up into this ball and don’t move, oftentimes the dogs lose interest." Read the entire article here. Dan – and Suzanne too, along with our friend and colleague Dr. John Wright, present the animal behavior section at the National Animal Control Association’s Level I Training Academy, held at various locations across the U.S. every year. That’s why Dan was referred to as being connected with them in the article. "We once again had a wonderful responde to the program you presented, despite the snowstorm! Thank you so much for your generosity in giving of your time and expertise. Perhaps we can plan something—in the summer!" Members of our Behavior Education Network have access to the audio recording of this lecture AND Suzanne’s lecture on Understanding Your Cat (see below). It’s easy to become a member – Just Click Here for more information. Publication: Are Dogs with Separation Anxiety Overly Attached to Their Owners?. CVMA Voice: 2009 (3): 19, Colorado Veterinary Medical Association, D. Estep and S. Hetts. This article addresses what is seemingly a misconception, which is that dogs that panic when left alone, or are separated from their owners, are more attached to their owners than the typical dog. Turns out that research is not supporting this belief. Why some dogs develop "separation anxiety" and others do not still isn’t well understood. Click Here to read the full text of the article. Interview: Suzanne contributed to an article about "dominance" in the Brazilian pet magazine Cães & Cia (Dogs and Company). We can’t reproduce the article for you because it is in Portuguese, but you can visit the magazine’s website if you’re interested at www.caes-e-cia.com.br. "It was not only educational and informative but it kept the audience amused and laughing too" What more could you ask for? Thank you so much for sharing your time and expertise. Our audience greatly appreciated it." Review: Suzanne’s Pet Behavior Protocols Book: What to say, what to do, when to refer, published by AAHA Press, received yet another very favorable review, 10 years after it was published! 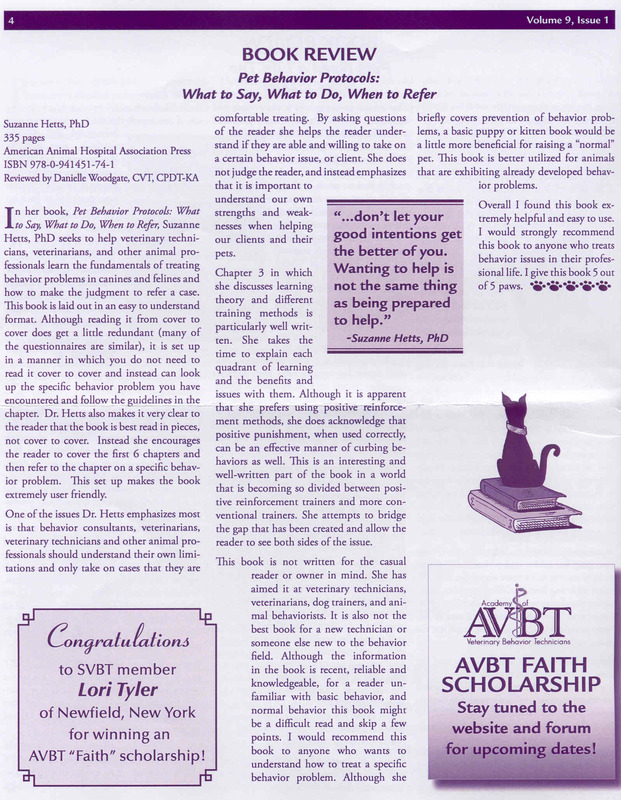 The book was reviewed by Danielle Woodgate, CVT, CPDT-KA in the Fall 2009 issue of The Society of Behavior Technicians Newsletter. A few quotes from Ms. Woodgate’s review: "This book is laid out in an easy to understand format… By asking questions of.. reader(s) she helps..reader(s) understand if they are able and willing to take on a certain behavior issues, or client. This (a discussion of positive punishment) is an interesting and well written part of the book in a world that is becoming so divided between positive reinforcement trainers and more conventional trainers. She attempts to bridge the gap that has been created and allow the reader to see both sides of the issue… I would recommend this book to anyone who wants to understand how to treat a specific behavior problem." Click Here to see the full review. Publication: Brain Games. Animal Wellness Magazine Oct/Nov 2009: 32-36, S. Hetts. In this article, Dr. Hetts writes about ways to keep puppies and kittens mentally stimulated so they can develop their "brain power", and learn about their world, while staying out of mischief and being safe. Publication: Safer Handling and Management of Dogs in the Veterinary Practice. CVMA Voice: 2009 (2): 24, Colorado Veterinary Medical Association, S. Hetts and D. Estep. In this article we provide tips and techniques to help prevent dogs from becoming fearful, defensive, or aggressive in the veterinary hospital. When dogs are calm and relaxed not only do they have a better experience but staff are safer, and everyone benefits. Click Here to see the full text of this article. This was my first webinar. I live in South Texas and no one ever comes here, or even close. This provides me a chance to continue my education and keep my motivation up.